Формы музыкальных произведений: Учебное пособие. 4-е изд., испр. The textbook “Forms of musical compositions” is written by a well-known music scientist and a teacher, Doctor of Arts, Professor V.N. Kholopova, who has 30-years experience of teaching the course “Music analysis” and “Musical forms”. The main peculiarity of the book, which is one-of-a-kind, is the coverage of the whole history of musical forms of European music, from the Middle Ages to the end of the 20th century. Another peculiarity is presenting not instrumental but vocal forms to the foreground: “Gregorian chant”, “Znamenny Chant”, secular forms of the Middle Ages and Renaissance, madrigal of the 16th century, choral concert, cantata, baroque aria, opera. 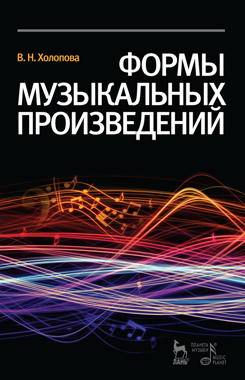 The chapter about ballet music forms is presented for the first time. Two special chapters are devoted to the music of the 20th century. The methodology of the work is distinguished by the connection of the music forms’ character with the esthetic and cultural attitudes of every epoch.